Source: Six O'Clok Scramble Meal Planner. Recipe Credit: Aviva Goldfarb & Shawn Askew. Photo Credit: Renee Comet. Author Aviva Goldfarb got this delectable recipe from Shawn Askew, who works at Bella Bethesda hair salon. 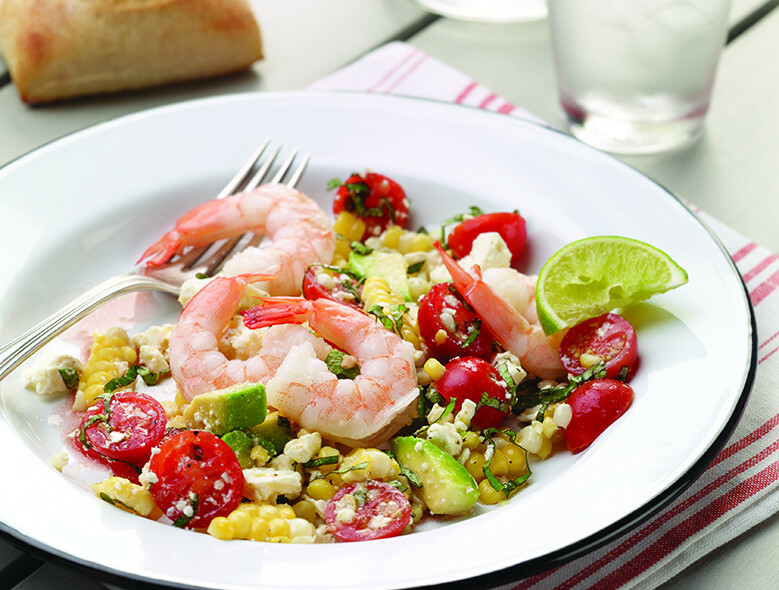 This recipe really peaks in the spring and summer, when fresh, farmer's market veggies help the shrimp and avocado shine. Serve with whole-wheat dinner rolls and you've helped solve the "Six O'Clock Scramble" for the perfect diabetes-friendly meal! This recipe from The Six O'Clock Scramble Meal Planner, by Aviva Goldfarb. To order directly from the American Diabetes Association, click here. DO AHEAD OR DELEGATE: Cook and refrigerate the shrimp, halve the tomatoes, remove the corn kernels from the cobs, or fully prepare and refrigerate the salad (wait to chop and add the avocado until just before serving). Pan-fry, steam, or grill the shrimp until they are pink, 3–4 minutes total. (Meanwhile, warm the rolls, if you are serving them.) Combine all the ingredients except the shrimp in a large serving bowl. Serve the shrimp on top of the salad. FLAVOR BOOSTER Add 1/4 teaspoon celery seeds or cumin and 1 tablespoon fresh lemon or lime juice to the salad. Lovely, light recipe. Definitely add celery seed. I added chopped baby kale for more fiber and color and put the salad on a bed of quinoa cooked in chicken stock for a bit more filling supper. Lovely plate.